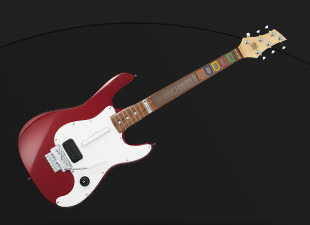 Logitech has announced their Wireless Guitar Controller, Premiere Edition for the Playstation 2 and 3 Guitar Hero. The neck and quiet fingerboard are made of wood and the frets and tuning peg handles are metal. The device has a 2.4GHz wireless USB receiver and a battery life of “hundreds of hours.” The controller has a range of up to 30 ft. and a bonus gig bag with pockets for accessories is included. Pre-order the nifty device for $249.99 for a December delivery.